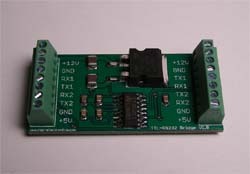 Custom serial patching module. Making custom serial line patches are a snap with this handy little module. Standard 0.1" spaced headers can accept a standard wire wrapping tool to make the connections. Great for prototyping or temporary interfacing.